Hi Pals. It's my day to blog... Actually everyday is my day, since it's my blog, but I have been sharing the duties with the boys. It worked out well last week. So, today, I want to ask you a question. As you know the boys are growing and HH is wanting to take them for car rides periodically to make sure they don't turn out to be screamers like she says I was. But the problem is getting the two of them to the car from the third floor condo. She wants to take them both at once, so she doesn't have to leave one in the car while she goes back up for the other. So let me know if you know anything about it. This one is about $124. Do you know of anything cheaper? Here's the website for the stroller... in case you want to take a look at it. That looks pretty cool, being able to move them from the stroller to the car without getting them out. They might be quite heavy in there together, though, when they become full size. Mom has often thought about a stroller for me, but never actually got one. She likes the kind of wheels on the one Daisy has (daisythecurlycat.blogspot.com/), but then the enclosed part isn't removable like the one you found. You can only call it a stroller if you refer to the boys as "animal companions..."
No help from us re: strollers, but a few bloggers do use them. Good luck! Our friend PumpkinPuddy has a stroller and has had one for a few years. It doesn't look like that tho, but she loves her stroller. Mack as a human stroller but he's a dog so we can't give advice for kitties! The stroller sure looks like fun. Keep us posted. I do love seeing cats pushed around in a stroller because I think it is the safest way to allow cats to explore the great outdoors and I wouldn't care if anyone thought I was weird by pushing Henry and Buster all around town either. I made sure my cats never thought the car to be the enemy but I never used a stroller to get them to the car (but then again I've never lived on the 3rd floor) so I just put the 2 in a large crate and off we go! Worked just fine! Do they come in my size -- look like fun! Sorry, we don't have a stroller, but I think the screaming is just fine! We don't have a stroller either but we are hoping you get good advice because the Woman has been thinking about one. Those strollers look like a lot of fun! We don't have anything like that but if we did we could go on a stroll with Sadie! We've never been put in strollers before but I think that would be a superb idea especially if it's to transport you kitty cats from upstairs to downstairs without too much hassle. I think you both will enjoy being in that stroller! You can even be brought out for daily walks while sitting in that stroller. Howevers, if you wants my opinion...I thinks dis is an awesome idea to be ables to gets da kittehs in da car (safely) and so they can explore outside (safely) and so da mom can gets them all upstairs at da same time (safely). Oh dog, Max...I would never been seen in a stroller, so I cannot help you. The one you found looks good...but will cats stay in there if it doesn't have a top closure?!? We can't help you out at all with strollers, but the Momster says it sounds like a good plan. We too are sending our best to all those affected by the tornadoes of the weekend, a wee bit too close to us for comfort. So much damage, so much loss, just so very sad. We don't have a stroller, but this one looks like a good one! Mom would like to know, too! I don't know about that one, but we've seen good reviews and results from similiar strollers. My mom person thinks it's a really good idea. Let us know what you decide. 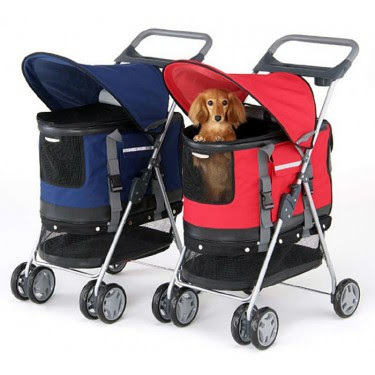 My human thinks these strollers look cool, but I can guarantee you that none of us cats here would like them. But then, we are all hard cases when it comes to 1) being confined and 2) being taken out of the house. It looks fine to my mum - and if the boys are OK in close proximity (as they seem to be) it probably would be good that they are together. The other bit of advice mum wants to pass on - is to do a few trial runs of just going to the house to the car - then have the car be a good experience for them- give them treats and sit in the car with them - but don't start the engine for the first couple of times. Next couple of times go for a short trip. Then introduce normal trips. It will reduce the trauma. glad I saw that Catsparella commented...i was going to direct you to her blog post today! Oh-oh... what's happening to Mousey? Wordless Wednesday -- What is Mousey doing? Blogoversary Day --Grand Prize Day!! !